Posted April 3rd, 2015 by admin & filed under Uncategorized. If you are interested in starting up or expanding an organic fruit and vegetable farm, I’d like to talk with you soon about your potential project for 2016. After starting up my own farm, My Neighbor’s Garden, and running it for a few years, I began to comprehend that the demand for local, organic fruits and vegetables is growing far faster than I will ever be able to supply from my small farm. Local food and sustainable growing practices are fundamentally important to me. I believe they are critical to our own health, our own community’s health and the health of our environment. So I’ve reached my branches out in an interesting new direction. I’ve begun to grow new farms and train new farmers. Organic fruits and vegetables can become the new normal. We need more farms. In 2014, I started up a new 5 acre organic vegetable farm in the Hudson Valley for a landowner who had been renting their land out for hay and corn production. We took their gross farm income from ~$500 per acre to ~$24,000 per acre. And now they have the infrastructure and procedures in place to bring ~75 tons of organic produce to their local markets each year. As a new farm start-up specialist and farm manager, I work with landowners and new farmers to design and implement a farm and market plan that will achieve their goals. This process may include anything from individual consultations, to creating a completely new farm with a landowner and managing that farm’s operations and developing its markets to profitability. My own specialties are establishing productive growing systems, season extension techniques, and capturing locally profitable market opportunities. 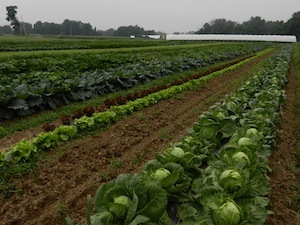 When growers wish to enter the wholesale vegetable market, I have experience with both the USDA Organic Certification process and the GAP Certification process and can expedite that approval process. I’m also familiar with wholesale grading and packing standards. While I was interning on an Amish farm with 20 acres of certified organic vegetable production in Lancaster PA, I learned the value of efficient production techniques. As a grower for Lancaster Farm Fresh, one of the most successful organic produce Co-ops in the Eastern US, I also learned the value of standardized procedures and cooperation among neighbors. It’s a model I like to share. In the off seasons, I was a traveling high tunnel technician and salesman. I visited some of the most progressive and profitable farms in the Eastern US and all of Canada. I’ve sat at kitchen tables and board room tables and have evaluated dozens of business plans for expansion opportunities. We examined market opportunities and made plans to implement new techniques and infrastructure improvements to meet them. Those are the experiences that I bring to the table. My passion is expanding the daily accessibility of good, healthy food into all segments of our communities – from top end urban green markets and chefs to local CSAs to food pantries and processors. If you share my passion, let’s work together to turn your property into a sustainable and profitable farm. We are a part of the solution.